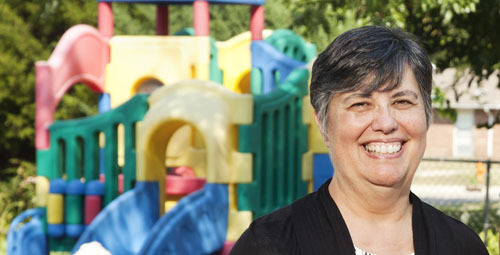 Children who receive crisis nursery services prior to being placed in out-of-home care are twice as likely to be reunited with their biological families as other children in Illinois' child welfare system, according to a new study by Susan Cole in the School of Social Work. CHAMPAIGN, Ill. - Children who receive crisis nursery services prior to being placed in out-of-home care are twice as likely to be reunited with their biological families as other children in Illinois' child welfare system, according to a new study by researchers at the University of Illinois. Illinois' six crisis nurseries - in Bloomington, Chicago, Peoria, Rockford, Springfield and Urbana - provide emergency child care for children under age 6 as well as support groups, parenting education and other services to help prevent child abuse and neglect. The study, published recently in the journal Children and Youth Services Review, examined the length of stay and placement outcomes of children in out-of-home care who received both crisis nursery and child welfare services between fiscal years 2006-2009. The researchers - Susan Cole, a professor in the School of Social Work at the U. of I., and Pedro Hernandez, who was then a research analyst in the school - followed the children until they were placed in permanent homes (or until the study's conclusion). Using two statewide databases, the Child Abuse and Neglect Tracking System, and the Children and Youth Services Information System, to identify children who had substantiated reports of physical abuse and neglect, Cole and Hernandez compared 198 children in foster care who had received crisis nursery services prior to foster care with children who had not. More than 49 percent of the infants and children who had received crisis nursery services were returned to their families versus slightly more than 31 percent of the children who had received child welfare services only. Almost twice as many of the children who received only child welfare services - 30.8 percent - were placed in adoptive homes or subsidized guardianship, versus 17 percent of children served by both crisis nurseries and child welfare. The results indicate that families who use crisis nursery services have better chances of being reunited with their children, perhaps because child welfare workers are more confident about returning children to their homes if they live in counties with crisis nursery services, the authors theorized. Or, the workers may view families who sought crisis nursery services as more resourceful than other families. Although Cole said they had expected to find the opposite result, the data indicated that children who had received crisis nursery services stayed in out-of-home care slightly longer - 379 days - versus 368 days for children in the comparison group. "That could be because parents who used crisis nursery services were being observed more closely," said Hernandez, who is now a data research analytics manager at Winston-Salem State University's Center for Community Safety. Or the families who sought crisis nursery assistance and subsequently had their children removed from their homes could have differed in some way from those who never sought emergency child care, Cole and Hernandez wrote in their report. Children in kinship care had the shortest stays in out-of-home placements - 274 days for those who received child welfare services only versus 349 days for those who received crisis nursery services. Older children and those placed in out-of-home care because of sexual abuse or lack of supervision were more likely to still be in foster care at the end of the study period. Illinois' six crisis nurseries had 17,000 admissions and provided more than 143,000 hours of crisis care and counseling during fiscal year 2010, according to the Crisis Nursery Coalition of Illinois website. However, state funding for the crisis nurseries is in jeopardy under the FY12 budget Gov. Pat Quinn proposed last week, which eliminated $318,700 in General Revenue Funds for the nurseries appropriated under the Department of Human Services. "It's worrisome that with the pressure on evidence-based practices that locally initiated services like the crisis nurseries may not be able to continue to get funding because they don't have the money to conduct ongoing evaluations," Cole said. "I was really impressed by the commitment of their paid and volunteer workers, and parents love the service. They feel really supported and don't feel like they're being bad parents because they're struggling." The crisis nurseries are particularly effective in decreasing stress for single-parent families who seek emergency assistance because of homelessness, mental health problems or family violence, Cole and Hernandez wrote in a 2007 study that examined caregivers' perceptions of the effects that crisis nursery services had on stress, potential abuse and parenting skills.